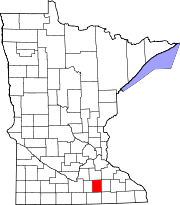 Steele County is a county in the U.S. state of Minnesota. As of the 2010 United States Census, the population was 36,576. Its county seat is Owatonna. The county was named for Franklin Steele, a prominent early resident of the state. Steele County comprises the Owatonna, MN Micropolitan Statistical Area. According to the US Census Bureau, the county has an area of 432 square miles (1,120 km2), of which 430 square miles (1,100 km2) is land and 2.7 square miles (7.0 km2) (0.6%) is water. The Straight River flows northward through the county, and the Le Sueur River flows through its southwestern corner. The Middle Fork of the Zumbro River rises in NE Steele County. Interstate 35 – runs north-south through west-central portion of county. Passes Medford, Clinton Falls, Owatonna, Hope, Ellendale. U.S. Highway 14 – runs east-west through upper central portion of county. Passes Owatonna. U.S. Highway 218 – runs NNW from southeast corner of county to intersection with US-14, southeast of Owatonna. Minnesota State Highway 30 – runs east-west across south part of county. Passes Ellendale. As of the 2000 United States Census, there were 33,680 people, 12,846 households, and 9,082 families residing in the county. The population density was 78 people per square mile (30/km²). There were 13,306 housing units at an average density of 31 per square mile (12/km²). The racial makeup of the county was 95.19% White, 1.07% Black or African American, 0.10% Native American, 0.85% Asian, 0.02% Pacific Islander, 1.65% from other races, and 1.12% from two or more races. 3.76% of the population were Hispanic or Latino of any race. 38.6% were of German, 18.5% Norwegian, 5.2% Czech and 5.1% Irish ancestry. There were 12,846 households out of which 35.50% had children under the age of 18 living with them, 59.50% were married couples living together, 7.40% had a female householder with no husband present, and 29.30% were non-families. 24.60% of all households were made up of individuals and 10.30% had someone living alone who was 65 years of age or older. The average household size was 2.57 and the average family size was 3.08. The county population contained 27.90% under the age of 18, 8.20% from 18 to 24, 29.00% from 25 to 44, 21.60% from 45 to 64, and 13.30% who were 65 years of age or older. The median age was 36 years. For every 100 females there were 97.50 males. For every 100 females age 18 and over, there were 95.00 males. The median income for a household in the county was $46,106, and the median income for a family was $53,981. Males had a median income of $36,366 versus $25,054 for females. The per capita income for the county was $20,328. About 4.20% of families and 6.20% of the population were below the poverty line, including 7.10% of those under age 18 and 7.10% of those age 65 or over. ^ "Minnesota Place Names". Minnesota Historical Society. Archived from the original on June 20, 2012. Retrieved March 19, 2014. ^ a b "State & County QuickFacts". US Census Bureau. Retrieved September 1, 2013. ^ Upham, Warren (1920). Minnesota Geographic Names: Their Origin and Historic Significance. Minnesota Historical Society. p. 531. ^ Nelson, Steven (2011). Savanna Soils of Minnesota. Minnesota: Self. pp. 43-48. ISBN 978-0-615-50320-2. ^ "2010 Census Gazetteer Files". US Census Bureau. August 22, 2012. Archived from the original on September 21, 2013. Retrieved October 25, 2014. ^ Minnesota Atlas & Gazetteer. Yarmouth ME: DeLorme. 1994. pp. 24, 33. ISBN 0-89933-222-6. ^ Leip, David. "Atlas of US Presidential Elections". uselectionatlas.org. Retrieved 10 October 2018. This page was last edited on 15 February 2019, at 12:59 (UTC).